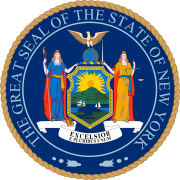 The 1970 New York gubernatorial election was held on November 3, 1970 to elect the Governor and Lieutenant Governor of New York. Incumbent Republican Governor Nelson Rockefeller defeated the Democratic nominee, former UN Ambassador and Supreme Court Justice Arthur Goldberg by more than ten percentage points. On January 1, 1971, he was sworn in for his fourth term as governor. Rockefeller received over 3.15 million votes in total, the highest total in any New York gubernatorial election until Andrew Cuomo received 3.35 million in 2018.